Designed by world aerobatic champion Quique Somenzini, the F-27Q Stryker delivers a thrilling blend of speed and aerobatic precision that’s unlike anything else in its class. Its fiberglass-reinforced Z-Foam™ airframe has been designed to handle abrupt wing loading changes at high speeds. 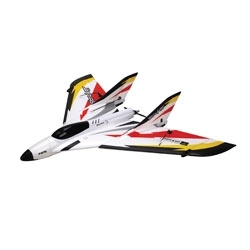 This, combined with its more powerful 480 brushless power system and twin rudders, gives you an extra dimension of aerobatic fun you won’t find with any other flight-ready flying wing. Flat spins, blenders, snaps, knife edge – the F-27Q does it all with the same smooth, predictable handing that’s made every Stryker a sport flying favorite. Prop Size: 6" x 6"